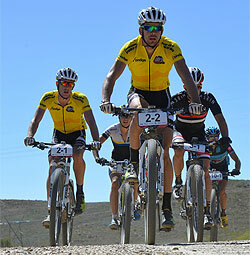 South Africa’s Yellow Jersey wearers, Philip Buys and Matthys Beukes (SCOTT Factory Racing) claimed a second consecutive stage win when they outsprinted a small lead group on Stage 3 of the Bridge Cape Pioneer Trek international mountain bike stage race on Wednesday. Second place went to the German Team Bulls pair of Tim Bohme and Simon Stiebjahn with South Africans Lourens Luus and Adriaan Louw (Fairview Elite) filling the final podium spot. Buys and Beukes retain their General Classification lead of 3 minutes 26 seconds over Team Bulls. In the women’s race, the Biogen Toyota Cape Brewing Co. pair of Robyn de Groot (RSA) and Jennie Stenerhag (SWE) claimed their fourth successive stage victory, also in a sprint finish, against Asrin Cycling’s Catherine Williamson (GBR) and Alice Pirard (BEL) and maintained their overall 13-minute lead. After Tuesday’s gruelling stage, which culminated with a mountaintop finish at the summit of the iconic Swartberg Pass; and with Thursday’s brutal Stage 4 looming, the riders appeared to consolidate somewhat on Wednesday’s Stage 3 over 107km from Prince Albert to De Rust. In the men’s race, a pack of five teams reached the final 20km in the lead group - SCOTT Factory Racing, Team Bulls, EAI Cycling, Fairview RECM (Lourens Luus and Adriaan Louw) and Asrin Cycling’s (James Reid and Herman Persteiner). Unfortunately for Asrin Cycling, Persteiner encountered a mechanical with his chain, which eliminated them from the final dash. The remaining quartet shared the workload into a strong headwind, but rode a tactical approach to the finish, which included two 90-degree turns and a slightly uphill finishing straight. “We predicted this morning the stage might finish in a sprint so were ready for it. We’ve discussed our sprinting tactics quite a bit, but didn’t have to implement them today as Simon (Stiebjahn) made the first move and we were forced to react. Matthys went after him and I watched Tim (Bohme). Simon faded a bit and that allowed both Matthys and I to go across the line ahead of them,” explained Buys. 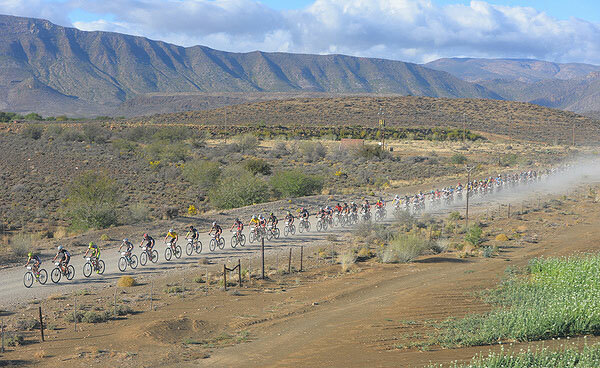 Thursday’s Stage 4 is likely to be the most decisive of the 2014 Bridge Cape Pioneer Trek. With 2690m of ascent in 109km, it promises to make or break podium ambitions. It could also prove the toughest test for many of the amateurs, who are aiming to just complete the event. The stage starts with a 25km steady drag before taking riders through the dry, rocky Kammanassie Mountains and over to the forested coastal belt area of George. The contrasts on this stage are remarkable and could well contribute to a General Classification shake-up. “It will be a tough stage tomorrow. But Matthys and I will not be riding defensively. We’re keen to push the technical sections hard, but will stay as safe as possible,” revealed Buys. In the other team racing categories, South Africans Brian Lennox and Hannes Hanekom (Klein Karoo Giants) were the top Amateurs, moving into the GC lead in the process. South Africans Kobus and Fienie Barnard (Klein Karoo Mixed), won the sprint for the stage, but are still second on GC to Germans Max Friedrich and Jana Mischance (Firebike Tomotion by Blacktusk). 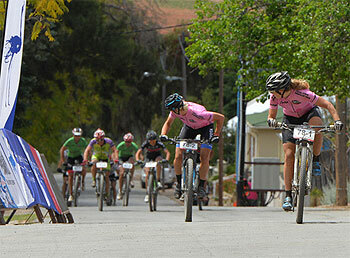 Heinz Zorweg (AUT) and Bartie Bucher (SUI) of Team Meerendal Wheeler 2 claimed a fourth consecutive stage win and further extended their category lead; while South Africans Johan Labuschagne and Gerrie Beukes (Klein Karoo Veterans) secured a second successive stage win and moved to within less than a minute off Veteran category leaders Fanie Venter and Wayne McDuling (Pynfabriek) in the overall. In the Solo men’s division, Travis Walker (RSA) won the stage in his category and moved into the General Classification lead, while Christine Janse van Rensburg (RSA), claimed another stage and extended her overall lead in the Solo women’s race. The ratel is known for being among the most fearless animals in Africa. This small, stocky animal has a fondness for honey, which is why it is also known as the honey badger.